What are the applications that may require special weighing pans? Different samples may require different handling and therefore METTLER TOLEDO developed special weighing pans, like a tubular weighing pan, for delicate samples like springs, wires and stents, bullion weighing kit to load and unload heavy items, or a dynamic weighing kit. In order to increase weighing efficiency we offer innovative SmartPan (precision balances) and SmartGrid (analytical and microweighing). For better visibility of light colored powders and stains use our special grey drip tray. Is it neccessary to use a draft shield in weighing? 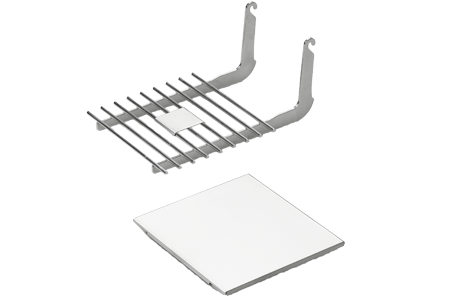 Draft shields protect your balance and your samples from environmental influences, optimizing both repeatability and stabilization times. This environmental protection becomes especially important when using balances with fine readability (≤0.001 g). Protecting weighing samples from surrounding influences by minimizing air turbulence ensures faster stabilization. METTLER TOLEDO offers a variety of draft shields for different balance models, as well as for applications like statistical quality control (min weigh door). 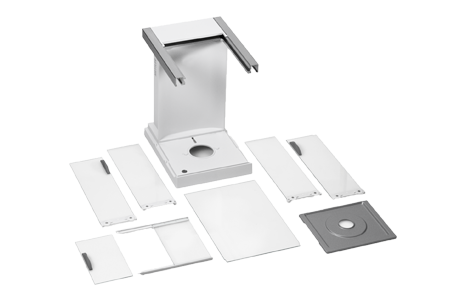 Special weighing pans for laboratory balances for easier execution of weighing applications, efortless cleaning and reduction of external influences on weighing results. Draft shields for laboratory balances for better weighing performance, protection of the precious sample and easy cleaning of your instrument.